Well, we're in warm, sunny Central Florida enjoying time with family here in The Villages. But we wanted to take time out to remind everyone that the Harvest Hosts memberships will be increasing on January 1, 2019 from $49 to $79 per year. HOWEVER, if you become a member before the end of the year, you lock in your rate of $49/year for future renewals. Only 3 days left!! UPDATE: The Harvest Hosts membership did in fact increase to $79 on January 1, 2019. However, the discount we offer you is now 15% rather than the 10% we had before the price increase. If you are new here or haven't heard of Harvest Hosts, I wrote a detailed Journal Entry back in August that you can check out here: Harvest Hosts on the RV-Dreams Journal. That entry includes links to a special landing page for Harvest Hosts that includes a 10% (NOW 15%) off coupon code at the top, and since that entry 294 new members have signed up using our RV-Dreams coupon code. It's a very popular program and, if you are interested, signing up before year end and saving $30 a year off the membership now and in future years would be a wise move. Click on the banner below to go to the Harvest Hosts landing page where the coupon code is shown at the top. But there is more. Harvest Hosts purchased RV Golf Club right around Thanksgiving. 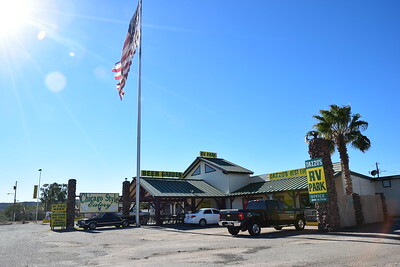 RV Golf Club is like Harvest Hosts, except their membership allows RVers to park at over 300 golf courses, private country clubs, resorts, and other golf-related venues. You don't have to play golf to be able to park your RV at the host sites, and there are no RV length or age restrictions. The regular rate for RV Golf Club was $99 per year, but starting January 1, 2019, you will be able to get Harvest Hosts & RV Golf Club (Harvest Hosts +Golf) for $99/year. BUT Harvest Hosts members that join BEFORE January 1, 2019 can get the RV Golf Club privileges for $27/year and lock that rate in for life. So, you can join Harvest Hosts now for $49 (less the RV-Dreams 10% off coupon) and get access to 675 free camping spots at wineries, farms, and other attractions, OR you can sign up for Harvest Hosts at $49 (less the RV-Dreams 10% off coupon) and then add on the +Golf for $27 and expand the number of places you can park by another 300+ golf-related locations giving you over 1,000 free parking spots. AND by joining before the first of the year, you lock in those lower rates for future renewals. Well, I had planned on posting at least once a week, but that clearly hasn't happened. And now it's almost Christmas and we'll be spending the next two-plus weeks in Florida. It's Christmas Eve, and we're flying out this afternoon heading to Orlando and then making the drive north from there to The Villages where we will spend Christmas and the following few days. Then we'll drive to Jacksonville for a special family event over New Years, before returning to The Villages for another week. I have to say, I'm looking forward to getting to Florida where the temperature swings aren't quite as drastic as they are here in Benson at 3,600 feet elevation. Our temps may climb to 70 during the day, but most mornings have been in the 30s when we get up. The consistently dry weather is quite nice, but we have to force ourselves to be outside for more than a few hours during the day. Anyway, I'll summarize what we've been up to. Linda & I have been joining others for pickleball here at Butterfield RV Resort every Wednesday & Saturday morning at 10:00. There are just a few players, most of them new, and the competition isn't as stiff as I'd hoped, but we're having fun getting some exercise and getting to know people. All of the above games can be played individually or as teams, and we tend to play in teams with Guys vs Gals. On days we don't play pickleball, I'm either playing golf or trying to catch up on writing detailed entries from this summers' travels. I paid $145 to get a seasonal membership at the nearby San Pedro Golf Club which gets me a discount on rounds, and it will pay for itself after about ten rounds. I've also joined the San Pedro Golf Association so I can participate in their various events and tournaments. I'm trying to play enough rounds to re-establish a golf handicap which I haven't had since we started on the road in 2005. My buddy Don runs a Monday morning game for RV park participants and some of the locals, and then there is a Friday morning game the Association puts on as well. Those morning games have usually had frost delays because of the frigid mornings. In my former life, I would play golf with temps down in the 50s, and on rare occasions, in the 40s, but going to the course when it is 35 degrees is well outside my comfort zone. When not participating in the scheduled events, I've been playing on Tuesday, Thursday, and/or Sunday around 11:00 when it's much more pleasant. Now my golf clubs are over 15 years old, they need to be re-gripped, and I now have two broken irons after my 5-iron exploded on impact the other day. To get them re-gripped and repaired, I determined I would be better off just buying a used, but updated, set of irons, so I made a road trip to Tucson and bought a set at Arizona Golf Exchange. My game is still very rusty, but it's coming around. And sunny days on the course watching coyotes, roadrunners, and lots of other beautiful birds with mountain backgrounds takes the sting out of those big numbers I'm still having that ruin decent rounds. While I'm out playing golf or writing, Linda is participating in craft sessions, daytime card games, domino games, and bingo or she is off exploring with her new friend, Suzanne. They made a roadtrip to the artsy town of Tubac, south of Tucson, and they went to the Winterhaven Festival of Lights with a group from the park where they rode on an Arizona Party Bike while viewing the lights. On Thursdays, several people in the park head out for ATV rides, although that's not really our thing. However, I did go out with Don & Steven one day as we rode down the dry river bed of the San Pedro River. Unfortunately, a new fence across the river stopped us. However, the river runs along the golf course, and we picked up about 30 golf balls to replenish those I've been losing in the desert. In addition to all of that, we have visitors that we hook up with. Some are just passing through and some are staying here in Benson or in Tucson 45 minutes to an hour away. Last Wednesday, we were visited by Rowdy & Missy who we've communicated with often and who we've met a few times. They are Alaskans, and with our upcoming Summer 2019 trip to Alasaka, we were quite keen on picking their brain. Plus they have invited us to stay at their place in the wilderness northeast of Fairbanks, so that will play into our trip planning. Along with everything else, I've finally started working on an Alaska itinerary. It can be overwhelming but, fortunately, we have several resources and lots of folks with Alaska experience we can count on for information and advice. And there is a topic started on our Forum - "Alaska - Summer 2019 - RVDreamers Sharing Plans" that will be helpful as well. One thing I've already learned is that many of the things we want to do are very expensive, and we're going to have carefully weigh our options. Certainly, as we get more of the planning done, we will share what we come up with. It will be epic. In addition to Rowdy & Missy, we've had dinner and an afternoon visit with Lynn & Ed, and enjoyed our time together before they move on in the next few days. They have graciously agreed to give us a ride to the airport in Tucson today. And speaking of that, I'd better get moving, so I'll wrap this up. To everyone out there, have a very Merry Christmas and we wish you all the best in 2019 and beyond. We debated about whether or not we would do a 2019 Boondocking Rally. One week we weren't doing it, and the next week we'd say "Maybe we will". A little over a week ago, we decided to leave our winter spot in Benson a week early at the end of March and squeeze in a Boondocking Rally before the 2019 RV-Dreams Educational Rally in April. 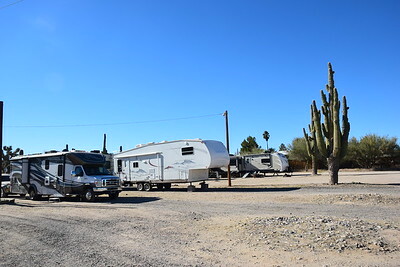 We considered several venues but decided to make it easy on ourselves and have it in Quartzsite once again in the Plomosa Road BLM 14-Day Camping Area. So, now it is official. The website is updated and registration is open. Click on any of the Boondocking Rally links to learn more and to register. The price is the same as last year - $95. Note that we limit this Rally to 40 rigs. Hope to see you there. Linda's birthday is Monday, December 10. But, we decided to celebrate today, Sunday, the 9th. I picked out a restaurant in Sierra Vista about 45 minutes south of Benson, and it isn't open on Monday. Plus, Linda wanted to be back in time for birthday bingo on Monday night. 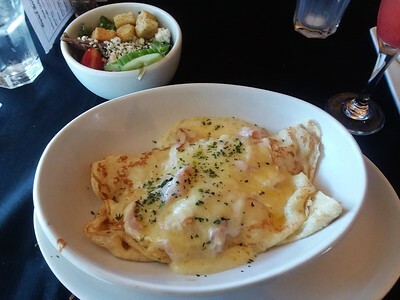 I had reservations for brunch at 11:00 at The Outside Inn, known as one of the better restaurants in the area. 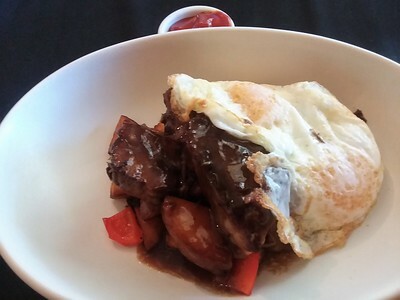 It doesn't look like much from the outside, but it has a nice, casual fine dining feel inside, and it is chef-owned. 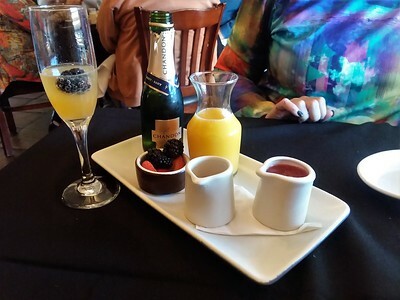 The birthday girl started with their "mimosa" flight, champagne, orange juice, two fruit purees, and fresh berries. Looking over the Brunch Menu, we had trouble deciding. We ended up ordering four dishes that ended up being way too much food. In a restaurant such as this, we expect small portions at high prices, but the portions here were not small. 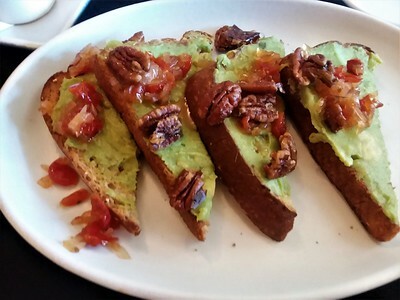 We started with two items from the "Beginnings" section of the menu. 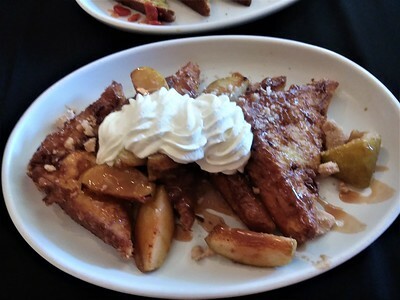 and I ordered the Apple Pie French Toast. What we thought were appetizers were full meals by themselves. which was, again, far larger than expected. Over half of that went home with us. which was nothing like what I think of when I hear "hash". Delicious, and none of that went home with us. And because it was Linda's birthday, she got her choice of a free dessert. She picked a caramel ameretto cheesecake which they boxed up for us. We were quite pleased with the start of the day. From The Outside Inn, we made the short drive to the movie theater in town where we were going to see a pair of movies Linda (and I) wanted to see. We started with "A Star Is Born" which people had been raving about. Bradley Cooper and Lady Gaga were both very good. We enjoyed it, and it's far better than the Barbra Streisand/Kris Kristofferson version. However, it's full of f-bombs and it drags in several places. And the relapsing alcoholic/drug addict celebrity story is tired. Again, we enjoyed it but neither of us have any desire to see it again. Next, we saw "Bohemian Rhapsody", the story of the rock band Queen, and it's lead singer Freddie Mercury. For us, and perhaps it's because we grew up listening to Queen and it's based on true events, "Bohemian Rhapsody" blew away "A Star Is Born". Again, there is alcohol and drugs but, with its PG-13 rating, they didn't go overboard. And this movie goes much deeper, and we found it far more entertaining. Well, that was fun. It had been a long time since we've been to the movies and seen a "double feature". We paid for both movies and the clerk gave us a senior discount although we were 10 years under their senior discount age. Perhaps she appreciated our honesty in paying for both movies as we easily could have watched the first one and then walked into any other theater as there was no one taking tickets or checking stubs. I had another idea in mind to end our time in Sierra Vista, but we bagged that plan and just went to Home Depot. We bought a faucet to replace the one in our bathroom, and we got some cord to hang some curtains in the front of the rig behind the cab seats to provide a bit more privacy at night and to block out the park street lights shining in our front window. We didn't worry about the privacy that much in the fifth wheel as we sat up so high, but anyone walking at street level can see right into our lower Class C.
Back at home, we split Linda's cheesecake and decided to stream the 1976 version of "A Star Is Born". We both thought we had seen it before, but we didn't remember much of it at all. Perhaps we remembered the Streisand parts of the soundtrack, because Kristofferson's singing was awful. Bradley Cooper was much better as a singer. For some reason, I thought the '76 version, even without today's technology, would resonate with us more. Nope. It was more unrealistic, bordering on goofy, and the new version had more really good moments. We've been so busy here at Butterfield RV Resort, that I hadn't looked in on the Journal comments. So I did that and posted answers and responses to several comments. Sorry for the delay in getting back to you. We added the activities from the Butterfield calendar (that we are most likely to participate in) to our own calendar. That will probably morph as we test the waters over the next week or two. The last Journal post from Benson, AZ left off on Sunday, so here is a quick rundown of our past week. Just day-in-the-life stuff. I signed up for a seasonal pass at the San Pedro Golf Club, and with that I got my first round of golf free. So, Gary and I played golf today. The fairways and greens at San Pedro are in good shape, but the bunkers are virtually unplayable. But it's a nice, challenging course that demands hitting it fairly straight. If you hit it sideways beyond the rough, the ball is pretty much gone. And I'm not hitting it very straight right now, so I'm leaving the good balls in the bag. We had an enjoyable afternoon, and I made another tee time for us tomorrow using the GolfNow website. The GolfNow "hot deals" are a better price than my "member" price, but there are only a couple of tee times each day to try to snag. In the evening, Linda went to Bingo in the Butterfield Banquet Hall. No wins, but she enjoyed it, and will likely keep that on her calendar. In the late morning, Gary and I played another round at San Pedro. The weather was pretty perfect but my game was worse. Oh well, it'll come around. Three more rounds and I'll have a "trending" handicap I can use to join in on some of the weekly outings and/or tournaments. While I was playing golf, Linda went to the Tuesday crafts session. She said there weren't many people there, but she met the yoga leader and may start going to yoga except on the day it conflicts with pickleball. Linda will probably end up teaching some crafts while she is here. 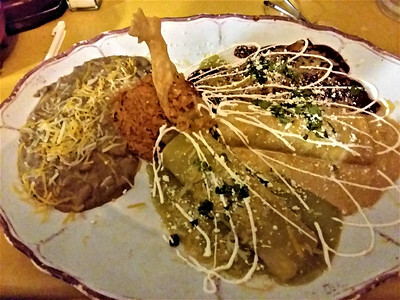 On Tuesday evening, we had dinner with Leesa & Gary at the "other" Mexican restaurant in Benson, Magaly's. It's not as good as Mi Casa, but it was Taco Tuesday, so $2 tacos. Gary & Leesa were heading toward Texas the next day, so we said our "see ya laters" with hugs and wishes for safe travels. This morning, we went to our first pickleball session. There is only one court, but there aren't that many players here now. Barb runs the Wednesday and Saturday sessions, but we can play anytime. She assigned us our own key to access the court whenever we wanted. Now, our first day of pickleball was a little scary as Linda fell in warm-ups. She was chasing a ball, lost balance and fell forward. I thought sure she had broken a wrist trying to catch her fall, but there were no broken bones. Her forehead bounced on the court scraping it up (her forehead and the court), but she was wearing a headband that cushioned her, and she was lucky she didn't land on her nose or chin. She hurt fingers on both hands and scraped a knee, but after a little rest, she was back on the court playing that same morning, although she was a little less gung-ho about chasing hard-to-get-to balls. Whew, that could have been really bad. It took a couple days for the finger injuries to get better, but she'll be fine. That evening, Linda & I joined in on Wednesday night Karaoke to see what that was like. It was a small crowd with an old playlist, but even I got up and sang a couple of tunes ..... without any liquid courage. However, the audience probably wished they had imbibed more having to listen to that. While there, we visited with Loretta who attended our very first RV-Dreams Boondocking Rally in Quartzsite back in 2013. We saw that she was in the park, so it was great seeing her again. Speaking of Boondocking Rallies, we are looking at doing one the last week of March 2019 in Quartzsite, but we haven't worked out the exact dates or details yet. Stay tuned. There isn't much on the park calendar on Thursdays. Many of the long-term folks have ATVs and they go riding on Thursday. However, Barb came by our rig to see if we wanted to play pickleball. If we're home, we're always up for some pickleball. I love any kind of sport, game, or competition. What is surprising is how much Linda likes pickleball. And her paddle skills are quite good. We enjoyed our session, and we hope we get a few more players after the first of the year. The weather warmed up in the afternoon, so we decided to wash the rig. There is a guy that washes rigs in the park, but he's busy and didn't return our call. So, we paid our $10 permit fee and did it ourselves. It's far easier than washing our former fifth wheel. We got out the screen that covers the windshield and the cab side windows. It gets pretty dirty, so we cleaned it up and put it on. And then I put wheel covers on the tires. Now we really look like we're going to stay a while. We had an RV tech come out to see about doing a modification on our holding tank drainage situation. As I've mentioned before, our gray tank doesn't drain via gravity. The gray water is pumped out with a macerator pump up and over our rear axle to the main drain outlet next to the black tank. So, if the pump goes out, we currently have no way to dump gray water. And, when we are on full hook-ups, we can't leave the gray tank open to drain because there is no place for the water to go and it just sits there. We have to go outside and push and hold a button to pump out the gray water. And since we're on full hook-ups and not conserving, we're taking longer showers, so we're filling the tank faster. We're on the 2-2-2 schedule. Two showers, two dishwashing sessions, and dumping every two days. The tech, Wayne, took photos and is going to ponder potential options and get back with us. We've found photos online of someone who has done a modification, but we think it can be improved upon. After Wayne left that evening, Linda went up to the clubhouse to play dominoes. She has met a new friend, Suzanne, who is our age, and the two of them have hit it off. Together, they are doing many of the activities and outings that I'm not interested in. It's a win-win for everybody. Friday was a terrible day for weather. Golf was cancelled and it rained all afternoon. 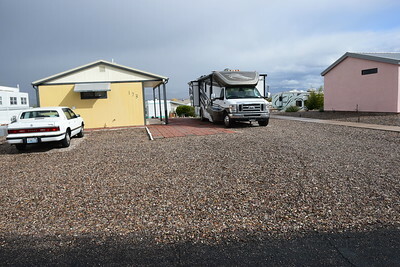 But our friends Kathi & Randy pulled in for one night on their way to their winter site in Mesa, the Good Life RV Resort. Usually, we have an RV-Dreams tradition of providing dinner on a travel day for those that come into our campground; however, Kathi reversed the program and they made us a spaghetti dinner in their Instant Pot. We enjoyed our meal and chatted a while before playing a couple games of Euchre. The evening ended with hugs and handshakes, and since they are just going to be up in the Phoenix area, Randy and I discussed possibly meeting in between and doing a hike at Picacho Peak one day. This morning was a park breakfast. We met some more folks, but we left early to give Kathi & Randy a tour of our rig and say our goodbyes before they pulled out. Kathi is interested in down-sizing, but Randy isn't so sure. At six feet tall, our rig is a little small for Randy. Our friend Don, who I'm guessing is at least 6'4", can't stand up in our rig without his head hitting the ceiling. I'm 5'8" and I have plenty of room, but this is not a rig for tall people. Then it was time for pickleball. We had six people today, and we once again had a good time. I'd play every day if we had enough interest. Later, Linda did laundry while I streamed a couple of basketball games. The laundry is attached to the clubhouse, so Linda can go in the little library and read or work on the jigsaw puzzles while she waits. So, that does it for this past week as we continue to get a feel for Butterfield and the people. The nights and mornings are colder here than I would like, and the trains are quite annoying as they blow their horns coming through town at all hours, but it's nice to sit for a little while, and there are enough activities to keep my interest and keep Linda socially involved while I get some work done on both our websites. We have been members of FMCA about a year now, and it's taken us this long to determine if we wanted to become affiliates or referral partners with them like we are for Escapees and Passport America. At the time we joined last January, we still owned a fifth wheel, but we thought we would join and see if it was something we could recommend and see how they did in attracting younger members and towable members. I wrote a long post back then that I didn't think the change in focus was a good idea, and I'm still not sure it is. However, they have increased their marketing and added new benefits this year, and for $50 a year RVers can certainly get their money's worth. Actually, the first year is $60, but as new affiliates, our readers can get $10 off when signing up using our promo code RVDREAMS18. Check out our "landing page" - FMCA RV-Dreams - and if you click one of the "Join FMCA" buttons, the sign-up form automatically includes our promo code. So, what does FMCA have to offer? All RV clubs promote the social connections you can make with other RVers, and FMCA certainly offers opportunities to do that. They have lots of chapters that cater to geographic regions, specific brands of RVs, and special interests. There are local, regional, and international rallies where you can meet people and find vendors for just about every RV product you can think of. But when I look at the various RV memberships, I tend to check the benefits to see how easy it is to recover the cost of the annual membership fees. Assuming we don't participate in any of the club's social activities or chapters, what does it take to cover our costs to be a member? We certainly can't participate in every social event or rally, nor would we want to, so it becomes a simple math problem for us. It's not difficult for most RV club memberships to pay for themselves, and FMCA is no exception. So, if that's the case, there's certainly no harm in joining. Join FMCA through our page and save $10 or continue reading to learn more about FMCA. Let's look at the FMCA benefits. TravelAssist - This is the benefit that separates FMCA from the other, less expensive RV club memberships and it's included at no charge and enrollment is automatic. FMCAssist is emergency medical evacuation coverage available to members worldwide as long as you are more than 100 miles from home. You can be traveling in an RV, car, plane, ship, or motorcycle to be eligible for this benefit. If you are a full-time RVer, you are always considered 100 miles from home. Some exclusions and limitation amounts pertain to this benefit. What do you need to do to enroll in this program? Absolutely nothing! As long as you are an active FMCA member, you are covered. This video explains what is and is not covered under this program. Side note: Good Sam offers a similar program called TravelAssist for an introductory rate of $60 individual, $70 couple, & $80 family for new members and then it reverts to the regular rates of $90, $100, & $110 per year respectively. Also, Coach-Net Premier roadside assistance plans include the similar Assist America plan. And SkyMed, which is a more premium medical evacuation service is $299 individual and $499 family per year plus a $75 application fee. Although SkyMed reps tout that service as being far superior to the others, I'm just not sure I agree for the difference in price (unless you have a medical history that makes you a higher risk of needing such services). None of those benefits really get me excited. The FMCA University could be a nice resource, but it's basically written articles that aren't always indexed properly and many are not dated, so you don't know how current the information is. The FMCA Videos are better and there is some useful information there. The Towing Guides are a really nice feature IF you have a motorhome and plan to tow a vehicle. If FMCA really wants to cater to towable owners, they should at least have towing guides for the trucks and SUVs most often used to tow larger trailers. 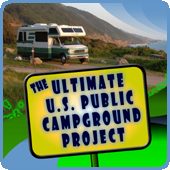 The FMCA Campground only has 15 sites, and reservations are now required. So, this benefit is nice if you are in the Cincinnati area, but it means nothing if you never travel through Cincinnati or if there are no spaces available when you plan to be there. I generally don't take time to read RV club magazines, so I can't comment on the value of the Family RVing magazine, formerly known as Family Motor Coaching. Many people really enjoy the various RV club magazines, and feel those alone are worth the price of the membership. I do know the January edition each year includes the FMCA Directory which has a lot of great information, so if you look at any of the magazines be sure to check out the first one of the year as it details pretty much everything you would want to know about your membership. You can view the magazines in digital format if you prefer. As full-timers, we don't want to receive the hard copies in the mail and pay to have them forwarded by our mail forwarding service, so we have selected the digital-only option. Stoppin' Spots - The January edition of the Family RVing magazine includes a list of "Stoppin' Spots", and this is a feature of FMCA membership a lot of people don't know about. Stop Over Spots - You're welcome to stop over at the volunteering member's home for a 24-hour emergency stay. Come Visit - FMCA members may visit the volunteering member's home for a 24-hour friendship stay, unless invited by the host member to stay longer. Mechanic's Helper - If an FMCA member's RV breaks down along the road in a volunteering member's area, the volunteering member is available to assist him or her in locating quality local service. Pinch Hit Driver -Any FMCA member who encounters an emergency that prevents the member from driving his or her RV while on the road may request the assistance of an FMCA member-driver to transport the RV to a chosen destination at the owner's expense. If you are familiar with Boondocker's Welcome, this is similar but there is no additional fee and Stoppin' Spots provides more assistance than just a place to stay, especially in emergency situations. I've done a very detailed write-up on the FMCA Health Plan here. It's one of the newest FMCA benefits, and it is a great alternative to Affordable Care Act (ACA) plans that may not have the national coverage many of us RVers need. The FMCA Health Plan has a PPO network and you can choose any doctor or healthcare facility you want. The annual enrollment period for ACA-compliant plans is ending December 15, so if you 1) haven't enrolled yet and want to look at other options, 2) have determined you can't afford an ACA or other ACA-compliant plan, and/or 3) you can't get coverage by December 15 and need alternative coverage, go to our FMCA Health Plan page and request a quote or a health insurance consultation. This benefit requires a two-year FMCA membership, but the FMCA Health Plan, in my opinion, is now one of the better reasons to join FMCA. There are very few details about this on the FMCA website. It just says that FMCA members get discounts from some of the top RV insurance underwriters, and you can get a quote through FMCAInsurance.com. The website provides the following disclaimer: "Discount not available in all states or from all insurance companies." I haven't found much anywhere that indicates this is a top benefit, but it never hurts to get a quote from multiple sources. FMCA has RV roadside assistance called Roadside Rescue through SafeRide Motor Club for $69 per year. It's basically the same roadside assistance that is offered through the Escapees RV Club for $99 per year. SafeRide is not an RV specialist, as they primarily brand their car roadside assistance service for lots of different partners. They are a fairly new player in the RV roadside assistance business and there just isn't a lot of information out there on how they are doing. This plan includes not only your RV (one RV) but all of the vehicles you own or rent, including motorcycles and utility trailers. And, if they provide the service they say they do in the video below, this is a bargain price. I just wish there were more reviews and user experiences posted. What is out there is sort of a mixed bag, and it's hard to determine if this is, in fact, a tremendous service for the price or a "you get what you pay for" type thing. As a full-timer, we're sticking with our expensive, but reliable and proven, Coach-Net plan which includes several other benefits in addition to the roadside assistance. But, if we can get a better feel for this FMCA SafeRide plan, we'll certainly be considering a change. Side note: For the boondockers out there, it is important to note that all RV roadside assistance plans include language that states services aren't covered if you are more than a certain number of feet (usually 50 or 100) off of a maintained road (usually interpreted as a paved road). They will still tow you or winch you out, but you will have to pay out-of-pocket. The FMCA plan has an exception to this policy IF you are attending an FMCA event and get stuck. 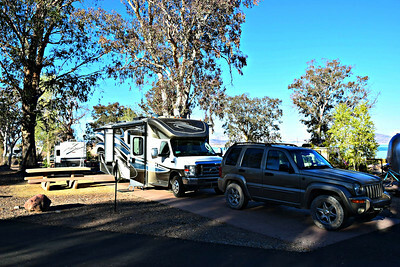 FMCA has several campgrounds as commercial members, and most of them offer 10% off the nightly rate for FMCA members. However, the number of campgrounds that offer the FMCA discount (a little less than 300) pales in comparison to those that offer a 10% Good Sam discount. And every campground I've seen that offers an FMCA discount also offers a Good Sam discount. This is a minor benefit that you may be able to use to recover the annual cost of your membership, but I certainly wouldn't join FMCA for this reason. FMCA members have long professed that the tire discount program alone justifies their membership. Members can get discounts using the Michelin Advantage and Continental Choice Tire Programs. However, the Continental program is currently ONLY for motorhome tires according to the FMCA website. The Michelin Advantage Program is good for commercial tires (Class A motorhomes), light truck tires, and passenger car tires and includes BF Goodrich as well as Michelin brand tires. Just be aware that there are some hoops to jump through, and not every Michelin dealer participates in the Michelin Advantage Program. Side note: The Escapees RV Club has a program with Goodyear for passenger care and trailer tires for 15% off on tires bought through Goodyear.com. And Coach-Net is now also offering discounts on Goodyear and Michelin commercial tires and they handle the process for you - it's much more user friendly. This, in my opinion, is one of the better recent benefits Verizon has added. With the Connect-On-The-Go plan you get a Verizon JetPack (mobile hotspot) for a penny and "unlimited" data for $49/month. The savings here could justify a big chunk (if not all) of your annual FMCA membership fee. It's especially good if you routinely use 25G of data or less per month. However, there are some "fine print" things you need to know. This plan requires a two-year contract with Verizon and a corresponding two-year membership with FMCA to keep the price locked in. This is a "stand alone" plan that requires signing up through the FMCA portal. You can't just call Verizon and add it to your existing service. And it's not truly "unlimited" although it does give you 25G of high speed 4G LTE data before the speed is throttled. However, this is still a really good deal as a regular 20G plan with Verizon is $110/month plus a $20/month mobile hotspot line fee and a JetPack (mobile hotspot) that is added to a current Verizon "unlimited" phone plan has a high speed data cap of only 15G before throttling kicks in. There is an early temination fee if you cancel the plan before the two years is up. It starts at $175 and then is reduced for each month you have the plan. Side note: Unfortunately for FMCA and FMCA members, this plan became less attractive when Verizon introduced a "truly unlimited" high speed data plan for JetPacks last month (November 2018) for $70. Yep, no data caps and no throttling on the JetPack. However, this is a stand-alone PREPAID plan requiring setting up a completely different account, and prepaid plans are subject to being de-prioritized behind "post-paid" plans if towers get heavily congested in your area. With that said, we switched our post-paid JetPack over to the prepaid plan in the middle of November, and we're very happy with it so far. But we were using and paying for about 40G of data per month, so now we get unlimited high speed data at a savings of about $70 per month. Of course, if you routinely use less than 25G of data a month, the FMCA plan is a better deal, and I definitely would go that route. Sprint doesn't have the geographic coverage of Verizon, but for those that stay primarily in Sprint coverage areas, this is another great FMCA benefit. The Tech Connect Plus plan is a truly unlimited data plan for $49.99 per month plus a one-time, non-refundable $39.99 rental fee for a mobile hotspot. Though it is a "truly unlimited" plan, it may be subject to "network management" slow-downs on congested towers. Like the Verizon plan, this is a stand-alone plan. You can't contact Sprint directly and add it to an existing plan. If you cancel, you have to return the mobile hotspot. If you don't return it within 15 days of cancellation, you will be charged $200. Again, Sprint has the smallest geographic coverage area of the national providers, but this is a great deal if you are in a solid Sprint area. And, because it's month-to-month, it may be a great short-term option if you have Verizon or AT&T and find yourself in an area where Sprint is better. 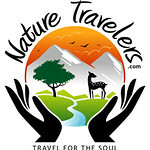 Fantasy RV Tours operates FMCA Tour Connection which provides member-only tours, caravans, and rallies at discounted rates. We've never been on any RV tours, so I can't very well comment on this as a benefit. I took a quick look at the Fantasy RV Tours website, and it looks like there are some FMCA-exclusive trips, but I didn't see any discount pricing. When I looked at the same non-FMCA tours, the pricing indicated was the same. Perhaps there is a discount offered in the booking process, so I'll reserve judgement on that. FMCA works with Custom Glass Solutions which manufactures most of the Class A motorhome windshields in the country. That's their specialty, and they help find shops and file insurance and warranty claims. They have a great warranty on their windshield replacements. Though they don't manufacture windshields for Class B or C motorhomes, they will help locate glass, find shops, and assist with insurance claims. The "benefit" is you get one year added to your FMCA membership for free once work is complete. It's a small perk, rather than a discount. This program doesn't help you with passenger car (towed vehicles), tow vehicles, or towable RV glass. FMCA members can purchase International Travel Insurance from Seven Corners (who runs the FMCAssist program) at discounted rates. This plan covers medical expenses due to injury or illness when outside your home country. Medicare does not cover you outside the U.S. There is "trip interruption" coverage although there are quite a few exclusions. And I didn't see any provision for "trip cancellation" coverage, which is a huge reason to purchase travel insurance in the first place. This company - RV PetSafety - offers a temperature monitor for RVs that is connected to your cell phone via an app. It provides high or low temperature alerts when you are away from your rig and your pets are home alone. The device is $249, but FMCA members get $40 off if you purchase a $15/month month-to-month plan or $60 off if you purchase the $10/month annual plan. The $249 is the retail price of the device, but it's rarely sold for that. Anyone can go to the website and get discounts; however, the FMCA discounts are $20 more that the basic public discounts. ".... receive the gift of a one-year membership to the KOA Value Kard Rewards program. With Value Kard Rewards, you receive 10% off your daily registration rate at any of KOA's 500+ campgrounds in North America. In addition, you'll earn points that are redeemable toward dollars off future stays, and you'll have access to exclusive KOA member-only offers!" This is a $30 value and a great way to try out the KOA Value Kard membership for free to see if it is something you might like to continue in the future. FMCA members get two months free when signing up for a year of mail forwarding service from this company in South Dakota, one of the top three domiciles for full-time RVers. In addition, for FMCA members, Your Best Address will provide vehicle registration services on your first vehicle to be registered for free (a $45 value). FMCA also has partnerships with Costco, Sam's Clubs, UPS, car rental companies, office supply companies, pet insurance companies, and even an auto dealership. And there is a listing of FMCA commercial members that offer discounts for products and services. I think this is still a club that is best for Class A motorhome owners as far as the social and educational aspects, but that may change as the years go by and the make-up of the membership changes. However, in the meantime, there is enough value in the membership to join, and it doesn't take much to recover the annual membership fee. We're going to be renewing next month, and if you'd like to join us as FMCA members, you can join through our new affiliate page and get $10 off. Around 10:00 a.m. on Saturday, we made the 3-mile drive from the Escapees SKP Saguaro RV Park to the Butterfield RV Resort in Benson, AZ. We got checked in and we welcomed by our long-time friends Don & Deb who are full-timers that have been here as Assistant Managers for 11 years now. We parked in Site 144, our home for the next three to four months. We're on a corner and it's a large site, so it won't be too claustrophobic for me. The monthly rate here is $475 plus electric - not bad at all. Now we'll just have to see if electric heat costs us more than propane. 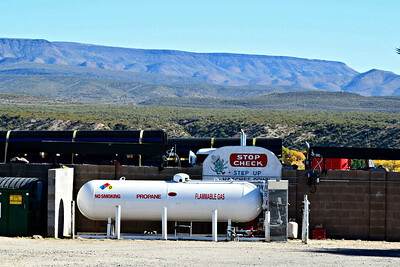 One of the things we wanted to do was see about hooking up to a large, exterior propane tank so we wouldn't have to move the rig to get propane if we needed it. Well, Butterfield makes it easy. They have 100-lb cylinders that you can "borrow", and before we were in our site very long, one had been delivered. I just had to figure out what connections I needed and how to hook it up. Fortunately, there is no special plumbing required. The guys at Barnett's Propane here in Benson had what we needed and showed me how to hook it up. 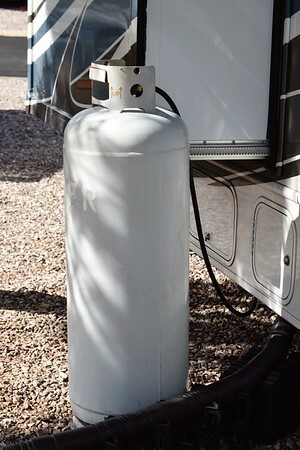 This is our propane tank with a cover over the regulator. And here it is with the cover off. I needed to disconnect the regulator and be able to move it five inches to the right. Verifying I had enough room, I purchased Barnett's version of a an "Extend-A-Stay" propane "T" connection. Unfortunately, I didn't take a picture of the device before I installed it. 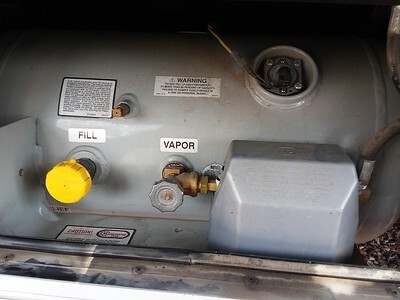 And though it is designed so that the hose from the external propane cylinder attaches at the bottom, the metal plate welded to the propane tank to protect it from road debris didn't allow enough room to install it the preferred way. So, I had to install it upside down - no big deal. 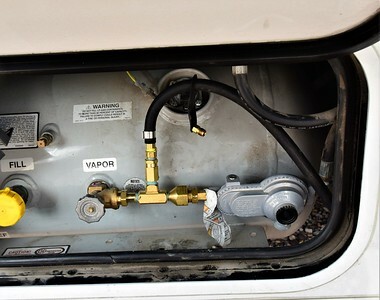 I also installed it so I could run the external hose in from underneath so we could close the propane compartment door. Even I could do it, so you know it can't be too difficult. It was just a matter of disconnecting the regulator on the right from the on/off valve on the left, and inserting the "Extend-A-Stay" in between. 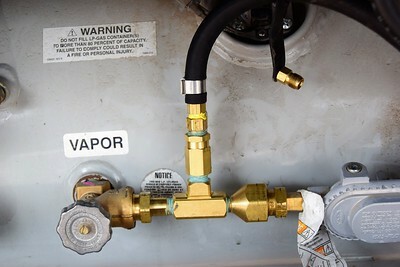 With the onboard propane tank turned off, I disconnected the regulator. The guy at Barnett's reminded me that the propane fittings are "left handed" so they don't follow the normal "righty tighty, lefty loosey". You turn them to the right to loosen. Don lent me some wrenches. Once the device was installed, I attached the 6-foot hose I got from Barnett's to the "T" and to the external tank. We turned the external tank on and there was clearly a leak where the tank hose connected to the "Extend-A-Stay". I tightened everything up, and then we used dish soap to check for leaks. We still had a small leak, so I used some PTFE Yellow Gas Line Thread Sealant Tape on that one connection and did a better job of tightening it. No more leaks. We tested the stove burners and our Truma AquaGo water heater and we're now drawing propane from the 100-lb cylinder next to our slide. 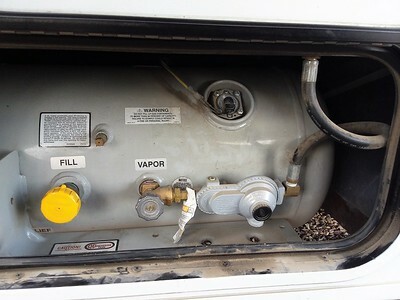 Basically, we're just by-passing the onboard propane tank, but we can still use it should the external cylinder run out. If that one runs out, then the park just comes and gets it and re-fills it for us. We pay for the amount we used, and they put it back. When we leave here, I can leave the "Extend-A-Stay" in and we can carry a small 20-lb tank with us to use as a back-up for boondocking if we want to. Camco sells an "Extend-A-Stay" kit and their device has an additional port so you can run another hose to your gas grill. There are lots of YouTube videos on the installation of that product, and though it looks a bit different, it's pretty much the same process as what I did. After completing that little project, we got cleaned up and went back over to the Escapees park. Linda and Leesa, went to Tombstone to shop, eat, and do a ghost tour at the Bird Cage Theater while Gary and I spent the afternoon and evening watching football. Ultimately, we stayed late again, and it was our third night in a row we were out after 11:00. Back home at Butterfield, we realized the trains running through Benson are closer and louder. I suppose we'll get use to them. On Sunday morning we slept in, and then I did my tour of the park to get my bearings. There is a clubhouse with a TV and pool table and four card tables, plus a separate library/computer room. There is an exercise room with some decent equipment and there is a nice laundry. They also have a banquet hall that seats about a 100, and there is a pickleball court, and an observatory. Unfortunately, the pool and spa are under construction. They are undergoing a renovation and were supposed to be finished in October. From the looks of them, I'm not sure they'll be completed while we are here. We're walking distance to the post office, a Safeway grocery, an ACE Hardware store, Linda's "nail lady", and more. And the San Pedro Golf Club, a municipal 18-hole championship course, is less than two miles away. My buddy Don runs outings and tournaments there, and I'm sure we'll be playing a lot of golf. I already got my seasonal pass, and I'll get my handicap re-established. In the afternoon, Linda did laundry. Then, at 2:30, we attended an ice cream social that celebrates December birthdays and anniversaries in the park. RVers love free ice cream, and today we had it with our choice of brownies, yellow cake, German chocolate cake, or carrot cake. We got to know a few more people, and I'm sure we'll (at least Linda) will become involved in all the social aspects of the park. In the evening, we joined Don & Deb, and Barb & Steven (the park activities directors) for card games. That was a good time, and we quit early enough to get in bed at a more reasonable hour. 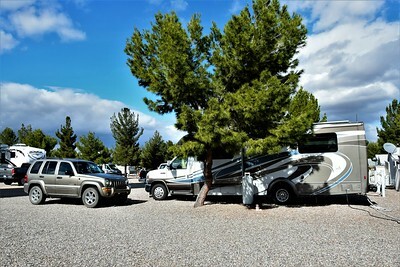 We've never settled into an RV park like this for more than a couple of weeks, so it should be an interesting winter. I'm the one that wanted to stay put for as long as we are which is unusual for our RVing life - I'm usually the one that wants to stay on the move. It's been several years since we stayed anywhere four months, and the three prior times were workamping gigs where I was starting to get fidgety arter two months and ready to leave after three months. So this will be quite a test for us, especially staying in our much smaller motorhome. Anyway, we'll keep you updated on this aspect of RVing which a lot of folks love, and which we simply haven't done up until now. After our wonderful time in Death Valley, we began our move toward our winter destination in Benson, Arizona about an hour east of Tucson. 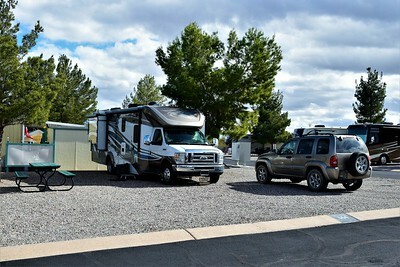 Because we sold our fifth wheel and bought our motorhome while we were in Pahrump, NV this past Spring, we took all the stuff that wouldn't fit in the motorhome and put it in a storage unit there. We left the Longstreet Casino this morning, and made the short drive to Pahrump as Linda wanted to pick up her beading and craft supplies to have for the winter. When we opened the door to the storage unit, we quickly started pointing to things we can get rid of. We'll sell quite a bit of it when we're here again in April for our Spring Educational Rally. After that brief stop, we fueled up and were glad to finally see some sub-$3 gas prices. From there, we continued on to Boulder City where we were going to stop for a night and see some friends. 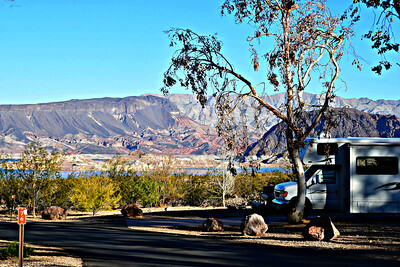 We chose the Boulder Beach Campground in the Lake Mead National Recreation Area. 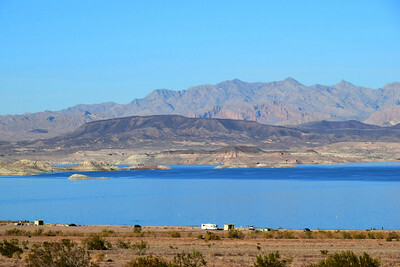 There are two campgrounds there - Boulder Beach Campground & Lake Mead RV Village. 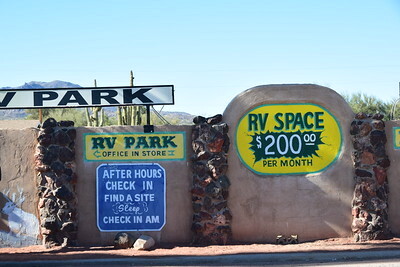 The RV Village has 115 full hook-up sites and you can make reservations while the Boulder Beach Campground has 154 no hook-up sites and is first come, first served. 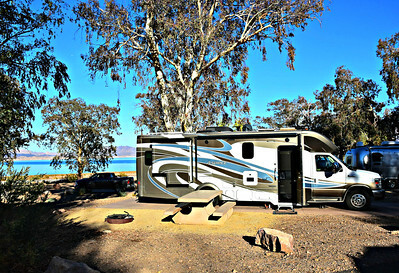 For a no hook-up campground, Boulder Beach is quite nice with paved roads and large, paved RV pads. There is a dump station and numerous places to take on water, and each loop has a bathroom with sinks and flush toilets. It was $20/night ($10 with a senior or access pass), and we liked the campground. It's also big rig friendly. and we were just one row from being "lakefront" although the lake is a long walk from the campground. 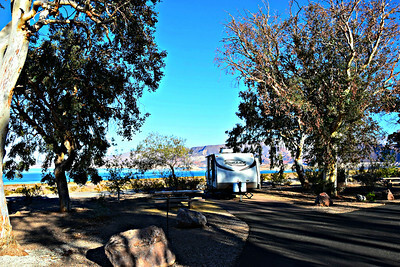 Oh, the campgrounds are inside the Lake Mead Recreation Area, so there is a $25 entrance fee. Fortunately, our Annual Parks Pass covered that - we've gotten way more than our money's worth on this $80 pass this year. After getting settled and relaxing a while, we drove into Boulder City where we were meeting friends John & Pam and their friends Dave & Sue for dinner. We met up at Vinny's Pizzeria and it turns out that we had met Dave & Sue once before. We met them briefly at a vendor booth at the Florida RV SuperShow in Tampa a few years ago. The six of us had a very nice time talking about RVing and other subjects while we enjoyed our Italian meals. Eventually, we departed with hugs and headed back to our campground. Today we were moving on south into Arizona via U.S. 93. 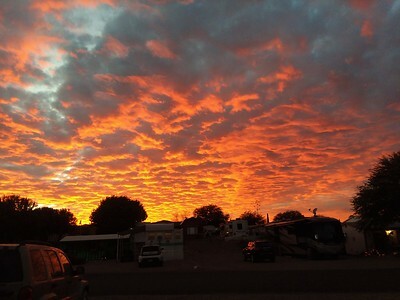 We were going to stay at the Burro Creek Campground where we spent our first night in the motorhome back in April. 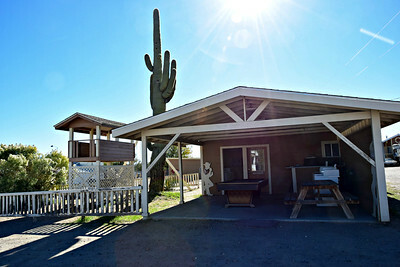 But Dazzo's Desert Oasis in Wikieup is a Passport America Park, and the full hook-ups for the $15 discounted rate trumped the $14 rate for no hook-ups at Burro Creek. (FYI, Dazzo's just raised their daily rate from $20 - $30 a couple weeks ago, so the Passport America rate on the website of $10 should now be $15). After today's 130-mile drive, we pulled into Dazzo's. Dazzo's is definitely not our kind of park while Burro Creek is, but sometimes hook-ups and good cell service override, especially for a single night in route to another boondocking spot. and a $200 monthly rate. We had leftovers from last night's Italian dinner, and packed it in for the night. It wasn't the most peaceful night, as somebody dropped off a fifth wheel in the site next to us at 1:00 a.m, but it wasn't too bad. On Monday, we continued south to Surprise, Arizona where we stayed with our friends John & Darla after a 110-mile drive. They are hosts for Boondockers Welcome, and we got to know them well early in the year when they let us park our rig there while we flew around the country to speak at RV shows. We got parked on their lot, and then we enjoyed a little Happy Hour on their patio until the sun went down and it got a but too chilly. On Tuesday, Linda & I hung out in the rig and got some work done. That evening we met Coleen Elkins at the Great Eagle Grill for dinner. Coleen found our website in 2007 and claims we helped her get her into full-timing. She is a former paralegal and has been a health insurance agent for several years. She has developed a team of RVers to assist other RVers with health insurance through her company, RV Insurance Benefits. We've been chatting and emailing for the last few weeks as I've been gathering information on the new FMCA Health Plan which was just introduced in August and is exclusively offered by RV Insurance Benefits. I have just completed a new web page with some details about this plan: FMCA Health Plan. I wanted to see if it was truly an alternative to the Affordable Care Act (ACA) plans. Certainly, the ACA plans will be more comprehensive, but for many that need individual coverage, there are fewer and fewer plans that offer national in-network coverage, and ACA plans have become unaffordable for more and more people that can't qualify for Premium Tax Credits. With the repeal of the "individual mandate" penalty effective January 1, 2019, a plan like this becomes more attractive. While it's not ACA-compliant, it does provide a national PPO network and benefits that will cover most needs at lower costs than an ACA plan. But go to our FMCA Health Plan page to learn more or get a quote. After our business dinner and watching a little basketball at the bar, we headed home under the brilliant star-filled sky and called it a night. I had hoped to play golf with John on Tuesday, but he already had plans. So, we decided to play early this morning .... really early .... before Linda & I headed to Benson. Through GolfNow, we got a 6:40 a.m. tee time at Sundance Golf Club in Buckeye. It was cold and dark standing on the first tee, and we couldn't see a thing at 6:40. So we delayed 10 or 15 minutes. I hadn't played since April, but sometimes I play better if I've been off a while. Not today. It was a nice course, but it requires some shot-making, and I was terribly inconsistent and rarely put the ball where I was supposed to. Still, we enjoyed the round, and we played with a young man that played for the University of Wyoming and is working to get a pro tour card. Quentin Pope won the 2015 Wyoming Amateur Championship and recently graduated from college, so he came down to the Phoenix area to work on his game. It's always humbling to play with someone that good, and it's fun to watch. As soon as I got back, we took a few minutes to pack up the rig. After saying our "thank yous" and "goodbyes" to John & Darla, we were on our way. Linda likes to avoid Phoenix, so we swung west on the Sun Valley Parkway to pick up I-10 for a short drive before taking AZ Hwy 85 south to Gila Bend and I-8. It made for a long drive, 230 miles, but I got a good deal of work done while Linda drove us to the Escapees Saguaro Co-Op Park in Benson. We came planning to park in their boondocking section, but they had a couple of full hook-up sites available for the three nights we would be here. Of course, they recently raised their rates from $20 to $25. It's still a bargain, but our timing hasn't been very good with respect to recent rate increases. We were guided to Site 173, a large site that the owners offer in the park's rental pool. This is a membership park run by the member-owners. You don't purchase a deeded lot, you purchase a membership that allows you an exclusive lifetime lease on a site. The memberships and lots are not transferable, so you either have to sell your lot rights back to the park when you leave, or, if you die, the lot goes back to the park and the park pays the value of your membership/lease to your estate. We've been here a few times before, and for many years we had our names on a waiting list for a membership and site. But we recently released our place on the list and got our deposit back. It is very inexpensive retirement living, but we just determined that we will ultimately be more likely to settle in Florida some day. Escapees has eleven of these Co-Op parks and Escapees members are entitled to stay at them for reasonable fees when there are open sites. With some friends staying here, we decided to spend a little time with them before moving over to Butterfield RV Resort on Saturday. We are planting roots there for the winter. We joined Leesa & Gary for an evening fire around their portable propane firepit and got caught up a bit before calling it a night. Linda went to the Safeway grocery to stock up while I worked all day. as we walked over to Leesa & Gary's Tiffin Phaeton motorhome where they cooked us a steak dinner. We talked and laughed for hours, finally returning home sometime after 11:00. I continued to work on Friday while Linda went to Kayla's Nails & Spa for a pedicure and manicure. Leesa joined her and the both got the powder-dipped nails. Linda was thrilled to find someone here in Benson to do this and it's walking distance from the park we'll move to on Saturday. Definitely beats driving to Tucson. Friday evening we joined Leesa & Gary for dinner at Mi Casa, a tiny, hole-in-the-wall Mexican restaurant known for great food and presentation. It was reasonably priced and very good. I have a feeling we'll be eating there a bunch the next few months. Oh, for those that have to have a beer or margarita with their Mexican dishes, Mi Casa doesn't serve alcohol. Now, as we were getting up to leave, we saw our friends Lynn & Ed at the table right next to us. For an hour or so, we had been sitting a couple feet away and didn't realize it as we sat with our backs to each other. We hadn't seen them for a few a few years, and it was a surprise to run into them here. As it turns out, they are in the Escapees park in their New Horizons fifth wheel on our same row. They invited us over after dinner to get caught up, and we joined them until after 11:00. That's two nights in a row we were out past 11:00, and I can't remember the last time we did that. So, that catches us up for the last week. Tomorrow morning, we move to our site at Butterfield RV Resort where we will spend the next four months (at least three). It's been several years since we've stayed in one place that long, but we've been traveling a lot this summer, and even I am ready to sit for a bit. We're looking forward to spending time with our friends Don & Deb. We'll play pickleball, and I'll play quite a bit of golf while Linda does some crafting. And we'll eventually morph into the social activities at the park.